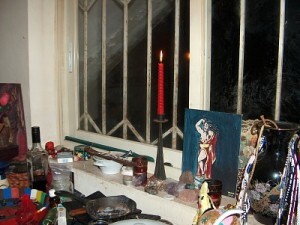 Home Obeah Information What is Obeah? There are many theories about the origins of Obeah, even the word itself. There are many words in many West African languages that have “obi” or “obea” in them that are connected to mysticism. Because many Igbo people were taken to the West Indies as slaves though, the term most likely originated from the Igbo word “obia” which means working as a healer or doctor. Obeah’s roots are in African Vodun and Igbo Odinani, as well as other regional African systems, but it developed into a distinct system of medicine and mysticism in Haiti, Jamaica, the Bahamas, and other islands in that region. Some call it sorcery or witchcraft, but I don’t like to use these terms because it is much deeper than saying some words and putting together some formulae. Unlike some western forms of witchcraft, it also does not come from an attitude of the Spirits serving the person, but the person serving the Spirits. Obeah practitioners would consider it unthinkable to summon a demon and give it orders as if it was obligated to obey. Like any Vodun practitioner, if we are calling on a Spirit, we follow the proper proceedure, approach with humility, and do not show up empty handed. Some may go as far as to actually befriend a Spirit. Indeed, many refer to the Orishas and deities as allies. However, it is constantly in mind that they are extremely strong allies who one does not disrespect without severely bad consequences. Because of its African roots, whether the Obeah practitioner is calling Eshu, Odin, Krishna, or a Tengu or Djinn, we approach them with African level respect. Obeah has a reputation as the most or one of the most powerful magical systems on Earth. As powerful as it is, the fact that most information about it is transmitted orally means that much of the specifics are secret. Obeah practitioners very rarely take on apprentices, and do not even teach it to their children or relatives unless they have the signs. A person’s secrets and discoveries can die with them. This is considered part of the natural order of things. We believe that some things a person should go through the steps of learning and discovery on their own. They should not be written down or passed to others because they won’t learn what they are supposed to learn by discovering the Truth on their own. The journey, in many cases, is as or more important than the destination. This does not mean that Obeah people never teach or share. Indeed, we are often very generous with laypersons in giving information that will help them in their daily lives. We may also share information with people who have reached a certain level and deserve the knowledge. Though Obeah is very closely connected to the Yoruba style of Vodun, there are a few distinct differences. It does not rely on a strict hereditary priesthood, and it incorporates methods and techniques from other belief systems. The basic philosophy is that all people are children of Yemaya, regardless of the place they are born. So as long as a technique is sound and it works, it can be used to get the job done. Rather than sticking to a limited tradition, it draws from all. This is one reason why Obeah people are sometimes feared and sometimes looked down upon by practitioners of more ethnically centered traditions. Another reason for the fear is some true and some false tales of what Obeah people do to accomplish their goals. The use of psychoactive plants is one of the truths. We do use a variety of herbs for healing and for trance. Some are less concerned about legality than others. There is also concern about the use of blood in ceremony and the creation of talismans. Some would call what is done to sacrificed animals before they are dispatched, cruelty. Though I personally don’t practice cruelty to animals, and have any slaughtering done by a priest of Ogun or a shochet (a Jewish kosher slaughterer), some others are not so careful. Then finally, there is the use of death curses. Many believe that death curses are a normal thing in Obeah. It is and it isn’t. I’ll explain. It is normal in that there are Obeah people who do them. It’s just that it’s not something that is done normally. A death curse is not something that is done without thought or regard for the consequences. Though Obeah practitioners do not have a uniform religion per se, we all believe that no human is stronger than Nature itself, and that every action has consequences. Just as unjustified killing with your hands will bring the wrath of that person’s family, law enforcement, and the Spirits, unjustified killing with a curse will as well. There is a high price even for unjustified ill will, so for a conscious curse, the price is even higher. There are many perspectives about Obeah and many articles about what it is. Everybody has their view. The important thing to remember about it though is that though it is very individualist, the basis of it is Mami Wata. Obeah is basically eclectic Vodun in the West Indian diaspora. Obeah itself is neutral. The person practicing it can be basically good or basically evil. No human is totally good, so it can be used for evil purposes. One should ask themselves though, if a tiger is evil when she kills her prey or defends her cubs? Is a snake evil when he strikes because he is being threatened or mishandled? Some people are specialists at doing works that cause death and destruction. They are not given this talent for no reason or somehow against Nature. Nothing can happen that Olodumare (a.k.a. YHWH or Elohim by the Hebrews) and Nature do not allow. They were given their abilities for the same reason snakes are born with fangs and tigers are born with claws. How can I protect myself from Obeah curses? Don’t do bad things to people. That’s it. Anyone, no matter how small or insignificant you may think they are, can enlist the help of an Obeah person. In fact, one of the ways it arose in the islands is to take revenge on slave owners and other exploiters. When you do bad things to people, you put a wound on your soul. Even in the scientific sense, harming others damages you psychologically. So the more wrong you do to others, the more vulnerable you become to dark forces of Nature. Also, bear in mind that what Nature and the Spirits of Nature considers wrong may not be limited to what humans consider wrong. If, for instance, you marry someone for money or for the purpose of exploiting them, what you’re doing may be legal, but this does not make it right. If you are a police officer and you arrest someone for smoking marijuana and beat him, again, legal but not right. If this person or someone else on their behalf, takes the matter to an Obeah person, then you could be in trouble. A curse is basically a removal of that person’s implicit protection over you in the natural network of humanity, and an entreaty to the Spirits for justice. Though you may not see it, all living beings and all things are connected. If that person’s wishing you well was the thing that stood between you and some disaster, you and perhaps those close to you will suffer. By the same, most Obeah people will not throw a curse unless it is justified. Some however, are young and immature, but very talented and much like the seemingly random snake in the bush or malaria causing mosquito in the jungle. Some are just crazy or petty. Dangerous people exist to keep us from becoming lazy and overly compliant. However, if you don’t harm people on purpose, and try to make amends for your misdeeds, you will at least have some protection. What do I do if I have been cursed? Think back on all the wrongs you have done to people, and start making amends. It may be that nobody has actually cursed you, but that you have done so much dirt that you’re choking on it. Time to pay the piper. If for some reason (such as causing greater suffering, or the person you wronged is dead) you cannot make amends, then you’ll need to take it up with the Spirits. You may have to do certain actions or give offerings to the Spirits you offended to remove the curse. Sometimes though, there is no way out. If you have been blessed, or got help from the Spirits to get something good, and then squandered or misused your gifts, you may never get them back. If, for instance, you were given the gift of beauty beyond your years by Oshun and then used that to exploit others, and someone throws a curse on you that this gift be taken away, you may not get it back, even if they forgive you. It’s Nature. If you do your best to make up for your wrongs though, you will be blessed in other ways. You will at least have peace and be stronger for what you have learned. How do I learn Obeah? Though this is, surprisingly, not a frequently asked question, it is an important one. Few people are interested in becoming Obeah practitioners because it is not a very glamorous life. No matter how much we have in the bank, most of us lead very austere lives, much like other scholarly types. Some of us are shamanistic and choose to live in tents or shacks in the wilderness to be away from people unless they come to us for services. Some of us are more urban, but still a bit reclusive. Some very few are capable of being very public, engaging, and charismatic without suffering overmuch from it. Generally though, we’re solitary people because this particular path makes one very sensitive to the thoughts and emotions of others. So if you choose to go this way, just be aware that you are not likely to be one of the fortunate who can live a “normal” life, much less enjoy fame. You may achieve fame, but it will probably not be something you enjoy. You’ll consider it the price you pay for being good at what you do. To begin the path of Obeah, start a personal relationship with Eshu. Make an altar for him in your home, and ask him to teach you. Then brace yourself. It will be a wild ride. If you’re not quite sure what that means, and you’ve never done any kind of witchcraft before, then you should start with the absolute basics. Read the Witchcraft 101 series to find out what it is you’re getting into in the first place, and learn your personal pantheon, and get some experienced advice. Eshu will teach you and bring you knowledge about the Universe and yourself that you need. He will send people into your life to guide you, and he will remove people from your life who hold you back. It is not always a pleasant situation. You may learn things that are difficult for you to accept. Once your eyes are open, you cannot un-know what you know. You may have difficult dilemmas about how to use the knowledge that you gain. Just remember that none of us is stronger than Nature. Your ideals may not match up to the reality. Once you have accepted Truth and begun to use it to help others and yourself, your success rate will skyrocket because you are truly working in line with Nature, not politics or tradition. You then become like a force of Nature. You become an Obeah person. Is there initiation and priesthood? Well, there are some groups and houses in which there is a sort of hierarchy. Again, we are usually somewhat solitary and loathe to give away knowledge that may be misused, so it is rare to see a large group of actual practitioners as opposed to adherents. There is another reason aside of “stinginess” with information though, that isn’t often discussed, but is very relevant. That is the Obi itself. There is initiation though, and this is the process of a person who has the Obia transmitting or sometimes even passing it to another, usually a student or descendant. To be clear, there is Obeah as a belief system, and then there is Obeah as a state of being. The two are related, but not exactly the same. In a group of Obeah practitioners and people close to them, there is a higher likelihood than normal of a person being born with the Obia, but not everyone who practices Obeah has the calling to service or duty that someone who has the Obia does. It’s like there are many Christians, but not every Christian is called to dedicate their life to service in the way of a monk or nun. Many are initiated into Obeah as a belief system, but merging with the Obia is something else. It is a special vein of the Great Mystery that comes from the Earth in an area stretching across northern and western and central Africa, that drives a person to spiritual service and esoteric practices. There is no real division between the Earth Forces in Africa and elsewhere, but in the human consciousness, there needs to be some sort of designation because there is some in the physical realm’s climate and resulting life and mineral “profile” of varying areas. There isn’t a specific geographical border where someone can say, “Here is where the Obi is, and here is where it isn’t,” but it just happens that people from certain areas got it, and in other areas, they got something else with a different “flavor”. It is somewhat similar to the classical Roman concept of “daemon”, only it’s a sort of cycling, multiplying, spreading something. At some point in human evolution and development, this Force reached out to man, and since then, people have been passing it. I will not say that it is impossible for the Obi to jump into a person, as it apparently does have a will of its own that no human can truly comprehend. This is likely how it happened to the first few people to catch it. It is just unlikely. Usually it is transmitted from live person to live person…sort of. The receiver may have to die, at least for a short while, to receive Obi or in the process of receiving Obi. So technically, a person can learn things that Obeah practitioners who have the Obi teach, but the learning by itself does not give them the Obi. I think one thing people don’t seem to get in all their excitement is that having the Obi is not something to pursue unless you get clear signs that this is your destiny. It is a heavy burden. It also means that whatever you learned before has to adjust to your new situation. There is no going back once you have it because you can’t un-know what you know or un-be what you are. Even some people who become devout Christians for some reason, probably because they went crazy from what they saw, can’t get rid of Obi once they have it. They can’t suppress it. It just shifts and adjusts itself and does what it is going to do regardless of what new frame the person attempts to put their spirituality in. Can a non African Person receive the Obi? Genetically, there are no non African people. Still, it is rare for a non African person to receive the Obi for both cultural and spiritual reasons. The cultural reasons are obvious. However, even when one does managed to encounter a non African person in the Americas who does not have some illusion of “white privilege”, they may already have something like the Obi, just from their lands of origin. It does happen though, so one should not assume that just because a person isn’t obviously recently African, they can’t have the Obi. If the teacher is told by the Obi that they should give it to a person, this is not really up to them. Also, many people who have recent African ancestry may not look African, but they are. They could be born with the Obi. Some things are very rare, but very little is impossible in this. Can I Do Obeah Spells For Myself? This is a very frequently asked question lately, since awareness of Obeah has increased due to the internet. The answer is not unless you have the Obia actively in you and/or you have been trained in Obeah as a belief and/or magickal system. There are some spells however, designed by Obeah persons, that a layperson can do well enough. In fact, there are many Obeah practices that are common, such as home protection, ridding a place of evil, etc. You don’t have to be a fully mature Obeah sorcerer/ess to make basic protection salts or a lucky hand. However, the minimum requirement is that you be respectful and observant of the Spirits and the cultures in which Obeah developed. For example, if you make a Go Away Evil spray without respecting the Spirits, its effectiveness will be limited to the bare energy that is left in the substances it is made of. It will expire more rapidly than it would for a mindful practitioner, and will just basically be an herbal scented air freshener. In a worst case scenario, you could end up making something that angers the Spirits. So if you are not doing at least weekly offerings and observances of an African Gate Keeping deity, you should not attempt to do any Obeah spells or other workings or recipes without at least the supervision of an experienced Obeah person. Spells are the privilege of the observant. Period. How do I tell who is real and who is fake? As far as witchcraft and sorcery in general, the real are doing the work, and have proof of it. The fake are not doing the work, and therefore have no proof that they are doing it. Traditions and practices vary, and there is a lot of cultural and educational exchange between Africans in the Motherland and diaspora. So you may find a practitioner or priest of West African Vodun who uses elements of Kemetic magick, or Hoodoo to get things done. There are shrines in Africa with images of Ganesh, Shiva, and other Hindu deities. In the diaspora there are many people of mixed ancestry who draw on many sources from their own or adopted heritage. Respectful mixing is quite normal. So the measure of who is a legitimate sorcerer or practitioner is not in how “pure” their practice is to a specific regional tradition, but whether or not they are regularly observant, doing the ceremonies they say they are doing, and meeting the standards of their craft. So one may ask what is the Obeah standard? How does one know that they are dealing with a real Obeah person? A heritage Obeah person is usually African or Creole, from the east coast or Caribbean. If they are not, they should have been trained by someone who is. They should know how to use the regional plants and other resources in ways that are not in any of Scott Cunningham’s books. People from the islands and the east coast recommend them to you because they have worked with them before, and know them to be legit. With a real Obeah person, you will get tools to maintain the energy of the work and/or evidence that the ceremony you requested was done. Those on the internet also usually have photos and videos of themselves. If they are not public, they should have a way for you to contact them to receive them privately, or a less-than-public social media page or gallery you can browse at least. Legitimate practitioners also have a physical location. You can visit us at our temple or residence for a local appointment. For privacy reasons, we don’t all post our address and other details, but if you’d like to see one of us in person, feel free to ask. If someone doesn’t take live appointments, then they are shady. In the late 1800’s and early 1900’s, an occultist author named L.W. de Laurence ushered in a new style of Obeah that combined Hindu, west African, Judaic, and European styles of ritual magick. It solidified and to some degree validated the universalism of previously practiced Obeah, as well as bringing it to a wider audience. Though some may have issues with his work being associated with or overlapping with other streams of Obeah practice, he did write some very important and influential works that turned out to be very effective, and saved others from greater obscurity. He made it possible for the dedicated student to at least have where to start. Among some of his works that are considered “must read” are The Sixth and Seventh Books of Moses, The Greater Key of Solomon, and The Mystic Text Book of the Hindu Occult Chambers. Both the de Laurence and the heritage Obeah practitioners these days read mostly the same books, so there is very little distinction between the two except what they were taught by their elders. Heritage Obeah people tend to have been brought up using more of their local herbs and other resources, natural products, and prefer to make many things by hand. The de Laurence type tend to be less averse to synthetic and mass produced items…or at least this is how it used to be. Nowadays, more who were okay with certain modern conveniences are becoming less so. Because the west is becoming more natural in magick, the lines that used to divide and distinct us are blurring. It’s about time. Heritage Obeah is and will remain more trusted though. It’s hands on, passed from elder to progeny or protege, and there is the security of knowing that you’re dealing with a mature person trained by mature people who are well in line with the most mature: the Ancestors. So whatever books are read to expand our knowledge, we still rely mostly on the wisdom of our elders. What I mean by that is we don’t use grimoire or ritual magick in place of herbal and holistic medicine, offerings, and faithful observance and service of the deities. Crystals – an overview of various crystals and minerals used in Obeah, Kindoki, and diaspora Vodun. A list of Spirits commonly sought in Obeah, Hoodoo, and diaspora folk magic and spirituality. Obeah and Myal – a brief description of Obeah and Myal belief systems. House of the Divine Prince’s Voodootye’s video: What is legitimate in Hoodoo, Obeah, and Voodoo? It’s kind of an ad, but it’s appropriately so, since one of the things that is woefully missing in the discussion of legitimacy is transparency and results. Zindoki.com – very easy, basic spells, protections, and instructions for African and diaspora witches. The best translation of a collection of magical papyri from the Greco-Egyptian period. It is an amazing collection of spells, recipes, and prayers to various deities of the region. If you’ve been doing heritage Obeah, you will find a lot of it uncannily familiar. Do not try anything in this book if you are not daily observant and experienced enough in substitutions and offerings/sacrifice to know what the equivalents would be. Also beware of codes and traps. If you are an adept and experienced sorcerer though, this book will give you much joy and inspiration, new ideas, and “tightening up” of practices that suffered from too much vagueness. Translation of a collection of papyri dating from the 3rd century A.D. It is called the 8th Book or Moses although it is quite different from the Sixth and Seventh Books of Moses. Quite different. Again, don’t try the spells in this book unless you are observant and ready to follow through. If you will be incorporating any Jewish, early Christian, or early Islamic mysticism into your practice, it is important to understand the abrahamic pantheon in the proper historical context as a development on the Canaanite pantheon as opposed to an invader religion. For this, the Books of Enoch are extremely helpful and important. It’s the “missing link”. about obeah, about obia, can a white person be obeah, can a white person practice obeah, define obeah, eclectic vodun, how do i learn obeah, how to learn obeah, initiation, obeah, obeah information, obeah initiation, obi, obia, vodun, what is obeah, what is obia, what is the obi. Bookmark. Pingback: Orisha Online Altar − What is Voodoo? May I enter to learn obeah please? Thank you very much! Thank you for your question, Ethel. 🙂 I do not teach Obeah online, but I do teach general witchcraft. Though some elements of Obeah will shine through in my style of teaching, I have not been led to teach Obeah on the internet specifically. Others do, and I respect them for this, since it is an extremely challenging mission. It’s just that the task that I’ve been given is different: to help prospective witches, sorcerers, rootworkers, and others in this type of occupation to reconnect with the ways of their Ancestors and become effective practitioners regardless of which style they will eventually settle into. Obeah will only be the answer for a very select few, and there are already teachers for them. Our community is pretty stable. Others though, need our help to recover and stabilize. I have much regret and apologies to have to ask. i am inquiring about the proper spelling and pronounciation regarding a spirit. It sounds like Obigetkchi. It is a soulmate matchmaker. Greatly appreciatied if you are able to help. I am retired and still trying to acquire the path I should be on. Any suggestions or advice, excluding personal opinions? Hallo, my Name is Johann Musyl from Vienna, Austria. I have a question about obeah initiation online. Do you Know someone who is doing that. And can that obeah man or woman tell me if obeah is my path, my way? If you need more Information about me, please ask. Thank You very much for Youre answer to come. P. S. And can you tell me more about transmission of obeah? Hello Johann. 🙂 Thank you for your comment and good questions. Online, though it is possible to teach on some level, it is not possible to receive a full initiation online for a few reasons. Anyone can read about and learn the things that have been published, but there is a lot to Obeah that is not published, and for good reason. Some things are exclusive to particular lineages, and some thing must be passed from teacher to student live. In most lines that I’m aware of, there are things the teacher must do themselves. A teacher can however, initiate you specifically as an online or distance acolyte. This has been done since before the internet. One takes the vows of a student in order to begin learning. We tend not to call this “initiation” though because this word has been overused and misused to mean something that it doesn’t. People will claim to be initiated into Obeah, Vodun, or other African and diaspora systems, and take this to mean they are qualified to teach or to lord over others or claim ranks and titles that they did not earn to standard. The truth is that any teacher can form their own curriculum and standards and “initiate” people to their group, but that doesn’t mean what they’re teaching you will give you anything good or important. So don’t be so concerned with initiation just because some others make a big deal out of it. I’ve encountered people who were “initiated” to Orishas but had no idea what offerings to give them or how to care for any of the items they were given in the ceremony. 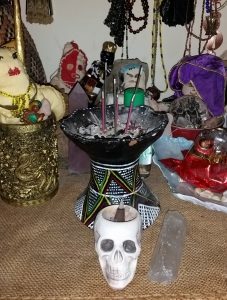 As to whether or not Obeah is your path, since we have greater access now, your best place to start looking is an Ifa or Afa reading from a qualified African diviner. They will tell you more about what you should do. Obeah may seem very fascinating, but it is, like any other spiritual system, very difficult for someone to get into as an adult. It is nothing like Wicca or other neopagan religions or magical disciplines. Though some have come in from other places to learn and one has reportedly received the Obia, this is extremely rare. These few instances should not be taken as normal or preferable. Unless you are connected to our community somehow, there is no real reason to pursue it. It is not the reclaiming of a dead belief system with a broken line. It is the continuation of a legacy of a very much living, unbroken, African tradition of sorcery. There are responsibilities and obligations involved that most people are not ready for, and no outsider really wants unless they have an ancestor or two prodding them towards this path. This is why online, I teach general witchcraft and not Obeah. Some others may, but I don’t because I don’t want to give anyone a wrong impression or be blamed for anyone taking what I taught them to claim a title they didn’t earn.